Eyes of Society is a short film that documents a group of artists from across Canada as they embark on a 14 day kayak journey to the UNESCO World Heritage Site and ancient Haida village of SGang Gwaay. The film reflects on the important role of an artist in society and how that differs across cultures and time. Filmmakers Allison Smith and Joseph Crawford of Braid Films capture Gwaii Haanas through the eyes of an artist, highlighting the imagery, emotion and artistic influence of natural spaces. This trip brings together artists W. David Ward, Andrew Sookrah, Anja Karisik, Gary Landon, Sophie Lavoie and April White. Directed by Allison Smith and Joseph CrawfordFilmed by Allison Smith and Joseph CrawfordOriginal Score by DeadhorsebeatsSupported by Seaward Kayaks, Green Coast Kayaking, The Haida Nation, Gwaii Haanas Marine Conservation Area and National Park Reserve, and Moresby Explorers. Watch Eyes of Society on Air Canada's In-Flight Entertainment as of March 1st - June 30th, 2017. 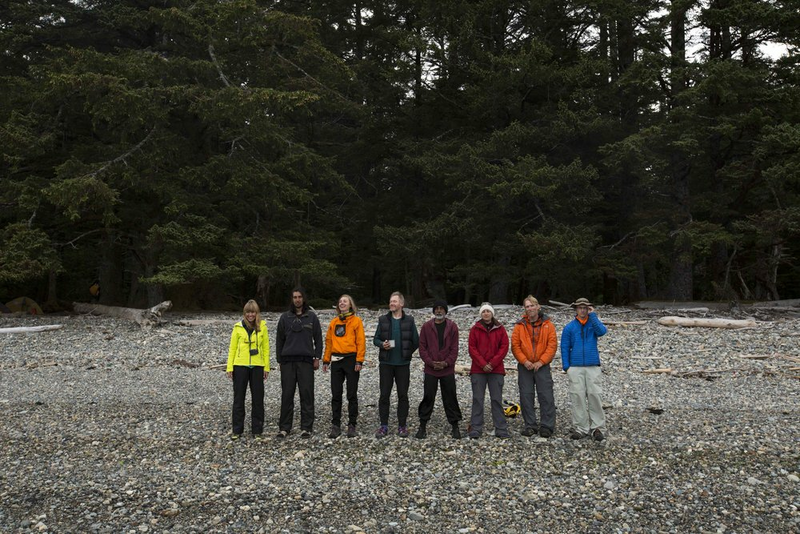 Left to right: April White (Sgaana Jaad), Charlie White, Anja Karisik, W. David Ward, Andrew Sookrah, Sophie Lavoie, Gary Landon, and Robert Landon. If you'd like to screen the film in your community below is a list of licensing amounts for one non-broadcast public or private exhibition of the film Eyes of Society. You may charge admission and keep the proceeds to fund-raise. You will be required to return the screening DVD.